"In the demo the Peep is placed on a rubbery surface, the glass bell jar is put over it, and the air pumped out. Air expands to fill whatever volume it is in, pushing on the walls of its container until the pressure is balanced. When the air outside the Peep is removed, the air in the little spongy holes expands to replace it. Because the Peep is soft, the material around the holes gets pushed by the air and expands as well, inflating the Peep overall. The tension in the material itself provides a force that keeps the air from expanding into the jar, so at some point the expansion stops when the forces balance." "However, that material is made of sugar molecules all stuck together in a crystalline state. 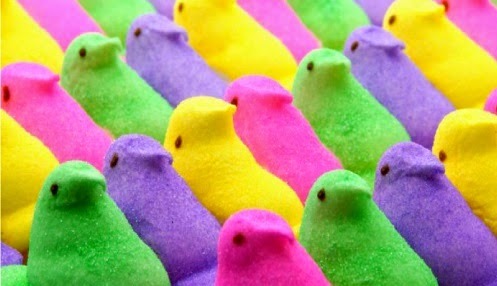 When the Peep expands, the crystal structure is partially broken, and it stays expanded only because the air pressure inside the bubbles is holding it up, balanced by the tension in the sugar. Once the air is let back into the bell jar the air inside the bubbles contracts again, and the material collapses. That part made me laugh even more than the expansion."